Will Vertical Farming Continue To Grow, Or Has It Hit The Greenhouse Ceiling? Agriculture has come a long way in the past century. We produce more food than ever before — but our current model is unsustainable, and as the world’s population rapidly approaches the 8 billion mark, modern food production methods will need a radical transformation if they’re going to keep up. But luckily, there’s a range of new technologies that might make it possible. In this series, we’ll explore some of the innovative new solutions that farmers, scientists, and entrepreneurs are working on to make sure that nobody goes hungry in our increasingly crowded world. A pair of lab workers, dressed head to toe in bright white biohazard suits, patrol rows of LED-lit shelves of lettuce, quietly jotting down a series of numbers and readings. Stacked some 15 to 20 feet high, the shelves cover nearly every inch of a massive 25,000-square-foot facility. As the lab hands pass by each row of lettuce, some in the germination phase, some ripe for picking, a psychedelic pink glow wraps around them, painting an almost extraterrestrial setting. This isn’t a scene plucked from Alfonso Cuarón’s latest blockbuster; it’s an everyday occurrence at a vertical farm in eastern Japan. The farm was built in the wake of a devastating magnitude 9.1 earthquake that rocked Japan in 2011 and led to a temporary food crisis in the affected area. After seeing the chaos, Japanese plant physiologist Shigerharu Shimamura decided to develop a more consistent, reliable model for manufacturing lettuce. 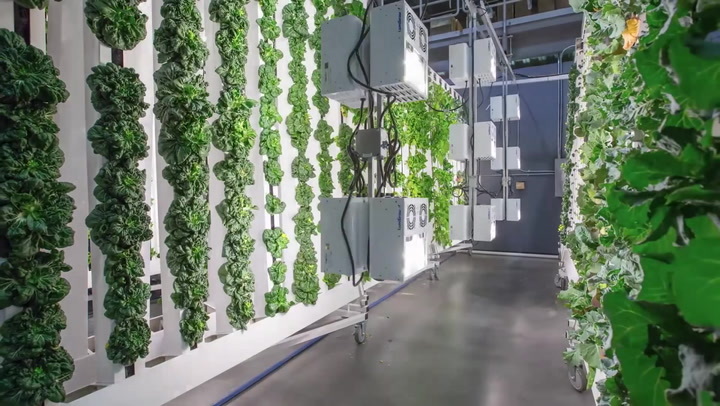 He ended up turning an old Sony-backed semiconductor facility into the planet’s largest vertical farm – a huge operation that now churns out an astounding 10,000 heads of lettuce per day. Recently, the facility (and others like it) has become a poster child for indoor farming. There’s now a rapidly expanding movement to bring this type of food production to urban centers all over the globe. It’s easy to see the appeal. In theory, indoor farms could allow us to grow food 24 hours a day, protect crops from unpredictable weather, and even eliminate the use of pesticides, fertilizers, and herbicides. If these farms were built in cities, we could potentially mitigate crop loss due to shipping and storage, and cut down on fossil fuel usage because food wouldn’t need to be transported very far after harvest. But of course, the idea of indoor farming isn’t without its detractors. Critics are quick to point out the method’s shortcomings when it comes to efficiency, effectiveness, and cost. In their eyes, vertical farming simply isn’t something that can be deployed on a large enough scale, and therefore isn’t a viable solution to our problems. So, who’s right? Should we start building giant, garden-stuffed skyscrapers in our cities, or abandon the idea and devote our efforts to improving existing (horizontal) farms? Could vertical farming legitimately help us meet the world’s growing demand for food, or are we chasing the proverbial pie in the sky? In his seminal book, The Vertical Farm: Feeding the World in the 21st Century, Dr. Dickson Despommier puts forth the theory that vertical farming is a prime candidate to help solve the growing food, water, and energy crisis in the United States. As populations continue to rise in urban centers around the globe, Despommier sees no other solution. When the book was first published in 2011, the indoor farming industry essentially stood as a barren landscape, with few companies setting out to literally put vertical farms on the map. Now, with Despommier’s written blueprint in the wild, the concept has recently gained a good deal of popularity. Aside from Despommier, a growing number of people strongly believe in a prominent future for vertical farms. Today, there exist throngs of vertical farming companies all geared toward making this innovative technology a reality. Unsurprisingly, it’s with Despommier and these upstart companies that the industry’s appeal rings the loudest. Companies such as Bright AgroTech and AeroFarmshave set out to educate and inform small farmers to grow locally in urban areas, while other firms like Freight Farms and Edenworkslean on unique and innovative growing concepts — such as shipping containers or rooftop aquaponics — to bring the idea to life. Thus far, there’s no real right or wrong way to go about it, and the recent influx of startups should only prove advantageous to the industry in the long run. As Despommier states on his website, it’s estimated that by around 2050, roughly 80 percent of the world’s population will reside in urban city centers, with the population of the world ballooning by an additional 3 billion people over that time. To Storey’s point, the diversity of vertical farms should allow these urban areas to continue to function as they do today. That is, access to food should remain a basic function of society, as opposed to it serving as a luxury should food production dwindle in the future. Like the Green Revolution from the 1930s to the 1960s, Storey believes the world sits poised for yet another research and development breakthrough regarding vertical farming. While the upstart vertical farming community largely agrees with Storey’s stance, there also exists a wing of detractors who point to indoor farming’s inefficiencies. The loudest voice among these critics is former United States Department of Agriculture biologist Stan Cox. After serving for the USDA for 13 years as a wheat geneticist, Cox joined the Land Institute as a senior scientist in 2000, specifically focusing on plant breeding in greenhouses and fields. An author of several books looking at the past, present, and future of all things agriculture and food, Cox is an expert in the field — which is why his view of vertical farming as a scam is a perspective that should give anyone pause. Vertical farming’s largest hurdle — a concept Cox thinks should’ve “collapsed under its own weight of illogic” and that he says remains incredibly difficult to overcome — concerns its scale. Cox posits that to be truly effective, vertical farms would require an incredible amount of floorspace. Despommier envisions indoor farming as a means to avoid the degradation of soil, but turning currently cultivated land into soil-preserving indoor farms would require an almost unfathomable amount of space. To get a true picture of this, Cox breaks down the floorspace requirement for growing just vegetables — which clocks in at roughly 1.6 percent of cultivated land in the U.S. While that number may not sound like much, turning that 1.6 percent of cultivated land into a functioning indoor or vertical farming operation demands the relative floorspace of around 105,000 Empire State Buildings. As Cox also points out, even with that much dedicated space, 98 percent of U.S. crops would continue to grow at outdoor farms. Despite Cox’s calculations painting a grim picture for large-scale urban production of grain or vegetables, he did emphasize that he’s “all for” urban gardening, or growing food as close to a population center as possible. To Cox, it just “makes sense.” Unfortunately, small urban gardening operations won’t likely have any shot at replacing the more than 350 million acres of rural U.S. cropland that consistently churn out America’s food supply. Plain and simple, Cox doesn’t see a way around the issue of energy as it pertains to vertical farms — at least for the sustained growth of something like grains or fruit. Because leafy greens require less light to grow sufficiently, it makes much more sense to operate vertical farms geared solely around these foods. Conversely, growing something like corn or wheat — which produce much more dry matter — just doesn’t seem like a feasible option if there’s an intention to keep energy, production, and food costs down. With the vertical farming industry still very much in its infancy, its future remains somewhat murky. Despite the growing number of startups committed to nurturing the idea, its hindrances and drawbacks pointed out by critics like Stan Cox carry just as much clout. Because of this, it’s hard to confidently put stock in either its failure or success. Vertical farming’s best shot at a lasting legacy may be to simply pump the brakes on continued advancement. As it stands today, the startups that currently run operations geared toward producing heaps of leafy greens might want to think long and hard about introducing anything capable of completely shutting down momentum — i.e., fruits, grains, etc. In this case, energy usage is the bane of vertical farming’s existence. Now, this isn’t to say vertical farming won’t continue to exist, or even that any of the startups dedicated to its advancement won’t try to introduce fruit or grain to their production. Perhaps there comes a time when someone finds a solution to the energy dependence issue, but for now, leafy greens are the vertical farming industry’s ceiling.